Parable of the Talents celebrates the Butlerian themes of alienation and transcendence, violence and spirituality, slavery and freedom, separation and community, to astonishing effect, in the shockingly familiar, broken world of 2032. 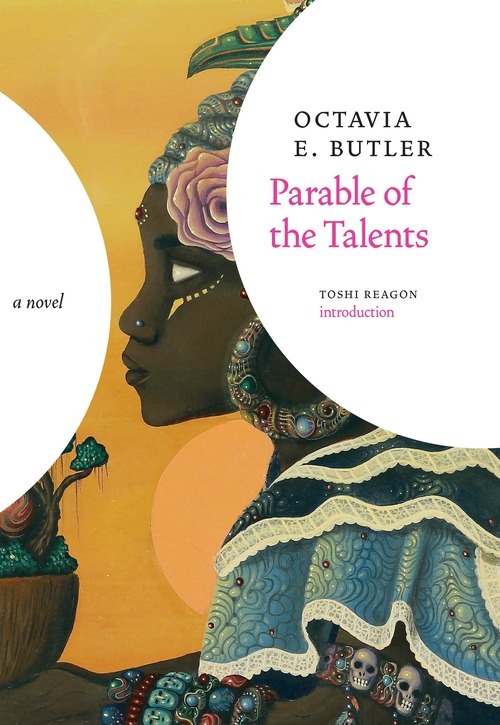 Long awaited, Parable of the Talents is the continuation of the travails of Lauren Olamina, the heroine of 1994's Nebula-Prize finalist, bestselling Parable of the Sower. It is told in the voice of Lauren Olamina's daughter—from whom she has been separated for most of the girl's life—with sections in the form of Lauren's journal. Against a background of a war-torn continent, and with a far-right religious crusader in the office of the U.S. presidency, this is a book about a society whose very fabric has been torn asunder, and where the basic physical and emotional needs of people seem almost impossible to meet. 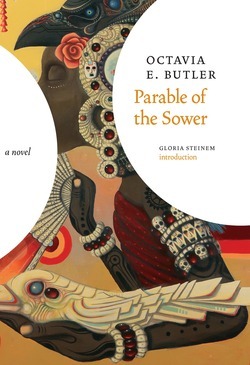 As Ms. Butler herself explained, "Parable of the Sower was a book about problems. I originally intended that Parable of the Talents be a book about solutions. I don't have the solutions, so what I've done here is looked at the solutions that people tend to reach for when they're feeling troubled and confused." And yet, human life, oddly, thrives in this unforgettable novel. And the young Lauren of Parable of the Sower here blossoms into the full strength of her womanhood, complex and entirely credible. Don't miss the first book in the Parable series, Parable of the Sower! 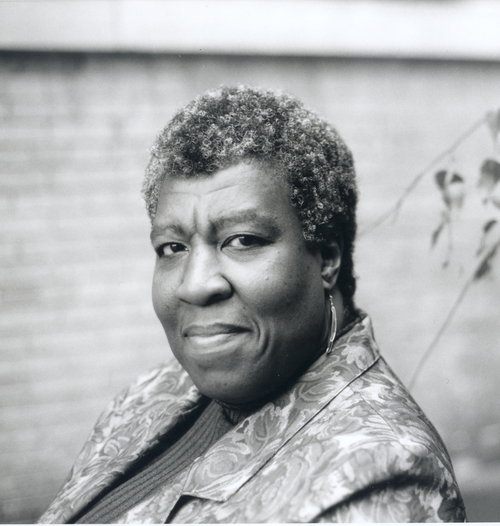 For Those Who Speculate: Octavia Butler and Other Fiction from Worlds BeyondCelebrating Black History MonthRadical Women Dark Fiction for Sunny Days Reading ListPride Month'Tis the Season for Discounted Books! Martha Bes looked around at the endless grayness that was, along with God, all that she could see. In fear and confusion, she covered her broad black face with her hands. “If only I could wake up,” she whispered. “Here with me,” God said. “Is that all you see?” God asked. This struck Martha as such a human thing to say that her fear diminished a little—although she was still impossibly confused. She had, she remembered, been sitting at her computer, wrapping up one more day’s work on her fifth novel. The writing had been going well for a change, and she’d been enjoying it. For hours, she’d been spilling her new story onto paper in that sweet frenzy of creation that she lived for. Finally, she had stopped, turned the computer off, and realized that she felt stiff. Her back hurt. She was hungry and thirsty, and it was almost five A.M. She had worked through the night. Amused in spite of her various aches and pains, she got up and went to the kitchen to find something to eat. And then she was here, confused and scared. The comfort of her small, disorderly house was gone, and she was standing before this amazing figure who had convinced her at once that he was God—or someone so powerful that he might as well be God. He had work for her to do, he said—work that would mean a great deal to her and to the rest of humankind. If she had been a little less frightened, she might have laughed. Beyond comic books and bad movies, who said things like that? “Why,” she dared to ask, “do you look like a twice-live-sized, bearded white man?” In fact, seated as he was on his huge thronelike chair, he looked, she thought, like a living version of Michelangelo’s Moses, a sculpture that she remembered seeing pictured in her college art-history textbook about twenty years before. Except that God was more fully dressed than Michelangelo’s Moses, wearing, from neck to ankles, the kind of long, white robe that she had so often seen in paintings of Christ. “You see what your life has prepared you to see,” God said. And she was sitting. She did not sit down, but simply found herself sitting in a comfortable armchair that had surely not been there a moment before. Another trick, she thought resentfully—like the grayness, like the giant on his throne, like her own sudden appearance here. Everything was just one more effort to amaze and frighten her. And, of course, it was working. She was amazed and badly frightened. Worse, she disliked the giant for manipulating her, and this frightened her even more. Surely he could read her mind. Surely he would punish . . . He didn’t answer at once. He looked at her with what she read as amusement—looked at her long enough to make her even more uncomfortable. “What do you want me to do?” she repeated, her voice stronger this time. When she was a girl, she had gone to church and to Sunday School, to Bible class and to vacation Bible school. Her mother, only a girl herself, hadn’t known much about being a mother, but she had wanted her child to be “good,” and to her, “good” meant “religious.” As a result, Martha knew very well what the Bible said about Jonah, Job, and Noah. She had come to regard their stories as parables rather than literal truths, but she remembered them. God had ordered Jonah to go to the city of Nineveh and to tell the people there to mend their ways. Frightened, Jonah had tried to run away from the work and from God, but God had caused him to be shipwrecked, swallowed by a great fish, and given to know that he could not escape. Job had been the tormented pawn who lost his property, his children, and his health, in a bet between God and Satan. And when Job proved faithful in spite of all that God had permitted Satan to do to him, God rewarded Job with even greater wealth, new children, and restored health. As for Noah, of course, God ordered him to build an ark and save his family and a lot of animals because God had decided to flood the world and kill everyone and everything else. Why was she to remember these three Biblical figures in particular? What had they do with her—especially Job and all his agony? “You’re going to destroy them . . . again?” she whispered. “Don’t worry,” God said. “I won’t be sending you back home with another message that people can ignore or twist to suit themselves. It’s too late for that kind of thing anyway.” God shifted on his throne and looked at her with his head cocked to one side. “You’ll borrow some of my power,” he said. “You’ll arrange it so that people treat one another better and treat their environment more sensibly. You’ll give them a better chance to survive than they’ve given themselves. I’ll lend you the power, and you’ll do this.” He paused, but this time she could think of nothing to say. After a while, he went on. This time when he stopped talking, Martha laughed. She felt overwhelmed with questions, fears, and bitter laughter, but it was the laughter that broke free. She needed to laugh. It gave her strength somehow. Still God said nothing. He smiled. Martha couldn’t decide whether he sounded annoyed. She couldn’t decide whether it was an honor to be chosen to do a job so huge, so poorly defined, so impossible. “Please let me go home,” she whispered. She was instantly ashamed of herself. She was begging, sounding pitiful, humiliating herself. Yet these were the most honest words she’d spoken so far. Martha thought of Job, Jonah, and Noah. After a while, she nodded. “Good,” God said. He stood up and stepped toward her. He was at least twelve feet high and inhumanly beautiful. He literally glowed. “Walk with me,” he said. It seemed that they walked over a smooth, hard, level surface, although when she looked down, she couldn’t see her feet. It was as though she walked through ankle-high, ground-hugging fog. “What are we walking on?” she asked. And it was so. It was as though it had always been so. They were walking through what could have been a vast city park. God went to a huge deep red Norway Maple tree and sat down beneath it on a long wooden bench. Martha realized that he had created both the ancient tree and the comfortable-looking bench only a moment before. She knew this, but again, it had happened so smoothly that she was not jarred by it. God sighed. “Always,” he said. “You believe the population problem is the worst one, then?” God asked. “I thought you wanted me to put a stop to war and slavery and environmental destruction!” Martha snapped, remembering the history of her own people. How could God be so casual about such things? God laughed. It was a startling sound—deep, full, and, Martha thought, inappropriately happy. Why would this particular subject make him laugh? Was he God? Was he Satan? Martha, in spite of her mother’s efforts, had not been able to believe in the literal existence of either. Now, she did not know what to think—or what to do. Martha frowned. “It’s . . . a star that explodes,” she said, willing, even eager, to be distracted from her doubts. Worse and worse, Martha thought, and she actually felt nauseous with fear. She turned away from God, hugging herself, suddenly crying, tears streaming down her face. After a while, she sniffed and wiped her face on her hands, since she had nothing else. “What will you do to me if I refuse?” she asked, thinking of Job and Jonah in particular. And, instantly, she thought of some of these—people who would be happy to wipe out whole segments of the population whom they hated and feared, or people who would set up vast tyrannies that forced everyone into a single mold, no matter how much suffering that created. And what about those who would treat the work as fun—as nothing more than a good-guys-versus-bad-guys computer game, and damn the consequences. There were people like that. Martha knew people like that. But God wouldn’t choose that kind of person. If he was God. Why had he chosen her, after all? For all of her adult life, she hadn’t even believed in God as a literal being. If this terrifyingly powerful entity, God or not, could choose her, he could make even worse choices. She shuddered and turned to face him again. “And what then? Did they go mad?” Even she could hear the disapproval and disgust in her voice. Martha shook her head and managed to keep quiet. “I don’t do that any longer,” God said. “And fewer of those will survive,” God said. “Some parents will certainly be too involved in dreams to take care of their children. Loving and raising children is risky, too, and it’s hard work. And she was alone. She was alone inside what looked and felt like her home—her little house in Seattle, Washington. She was in her living room. Without thinking, she turned on a lamp and stood looking at her books. Three of the walls of the room were covered with bookshelves. Her books were there in their familiar order. She picked up several, one after another—history, medicine, religion, art, crime. She opened them to see that they were, indeed her books, highlighted and written in by her own hand as she researched this novel or that short story. She began to believe she really was at home. She had had some sort of strange waking dream about meeting with a God who looked like Michelangelo’s Moses and who ordered her to come up with a way to make humanity a less self-destructive species. The experience felt completely, unnervingly real, but it couldn’t have been. It was too ridiculous. She went to her front window and opened the drapes. Her house was on a hill and faced east. Its great luxury was that it offered a beautiful view of Lake Washington just a few blocks down the hill. But now, there was no lake. Outside was the park that she had wished into existence earlier. Perhaps twenty yards from her front window was the big red Norway maple tree and the bench where she had sat and talked with God. The bench was empty now and in deep shadow. It was getting dark outside. She closed the drapes and looked at the lamp that lit the room. For a moment, it bothered her that it was on and using electricity in this Twilight Zone of a place. Had her house been transported here, or had it been duplicated? Or was it all a complex hallucination? She sighed. The lamp worked. Best to just accept it. There was light in the room. There was a room, a house. How it all worked was the least of her problems. She went to the kitchen and there found all the food she had had at home. Like the lamp, the refrigerator, the electric stovetop, and the ovens worked. She could prepare a meal. It would be at least as real as anything else she’d run across recently. And she was hungry. She took a small can of solid white albacore tuna and containers of dill weed and curry power from the cupboard and got bread, lettuce, dill pickles, green onions, mayonnaise, and chunky salsa from the refrigerator. She would have a tuna-salad sandwich or two. Thinking about it made her even hungrier. And they were walking together on a broad, level dirt pathway bordered by dark, ghostly silhouettes of trees. Night had fallen, and the darkness beneath the trees was impenetrable. Only the pathway was a ribbon of pale light—starlight and moonlight. There was a full moon, brilliant, yellow-white, and huge. And there was a vast canopy of stars. She had seen the night sky this way only a few times in her life. She had always lived in cities where the lights and the smog obscured all but the brightest few stars. She looked upward for several seconds, then looked at God and saw, somehow, without surprise, that he was black now, and clean-shaven. He was a tall, stocky black man wearing ordinary, modern clothing—a dark sweater over a white shirt and dark pants. He didn’t tower over her, but he was taller than the human-sized version of the white God had been. He didn’t look anything like the white Moses-God, and yet he was the same person. She never doubted that. “You’re seeing something different,” God said. “What is it?” Even his voice was changed, deepened. She told him what she was seeing, and he nodded. “At some point, you’ll probably decide to see me as a woman,” he said. “With you,” she said bitterly. They walked back to the house together instead of simply appearing there. Martha was grateful for that. Once inside, she left him sitting in her living room, paging through a fantasy novel and smiling. She went through the motions of making the best tuna-salad sandwiches she could. Maybe effort counted. She didn’t believe for a moment that she was preparing real food or that she and God were going to eat it. And yet, the sandwiches were delicious. As they ate, Martha remembered the sparkling apple cider that she kept in the refrigerator for company. She went to get it, and when she got back to the living room, she saw that God had, in fact, become a woman. Martha stopped, startled, then sighed. “I see you as female now,” she said. “Actually, I think you look a little like me. We look like sisters.” She smiled wearily and handed over a glass of cider. “As I’ve told you, you see what your life has prepared you to see.” God looked at her, and for a moment, Martha felt that she was looking into a mirror. God rested her head against the back of the chair. “Well, the evolving environmental problems will be less likely to cause wars, so there will probably be less starvation, less disease. Real power will be less satisfying than the vast, absolute power they can possess in their dreams, so fewer people will be driven to try to conquer their neighbors or exterminate their minorities. All in all, the dreams will probably give humanity more time than it would have without them. “Can the dreams teach—or at least promote—more thoughtfulness when people are awake, promote more concern for real consequences? “Make the dreams happen.” Martha said. “Do you want to remember being here?” God asked. “Even though in the long run they’ll almost certainly do more good than harm?” God asked. “Even so,” Martha said. “I’m afraid the time might come when I won’t be able to stand knowing that I’m the one who caused not only the harm, but the end of the only career I’ve ever cared about. I’m afraid knowing all that might drive me out of my mind someday. She stepped away from God, and already God seemed to be fading, becoming translucent, transparent, gone. “I want to forget,” Martha said, and she stood alone in her living room, looking blankly past the open drapes of her front window at the surface of Lake Washington and the mist that hung above it. She wondered at the words she had just spoken, wondered what it was she wanted so badly to forget.